Joshua's Girl: She's Here! So thankful. The last two weeks have been the toughest of my life thus far. I'm not a dramatic person, so when I say that, I'm not trying to make something more than it is. I know many people have gone through much worse, and honestly, parents who have gone through this before me our now my heroes. It started on Christmas day when I noticed some fairly strong contractions. I had already had a scare a few weeks before, so I brushed them off as braxtons. We continued with our plans, and were on our way to his parents. But, the contractions continued much stronger & closer together. We decided it would be better off to visit triage than to risk it per my doctor's advice. So we headed to the hospital not really sure what to think. An hour later I was checked into the hostpiatl, dialted to a five, 80% effaced, and having regular contractions. 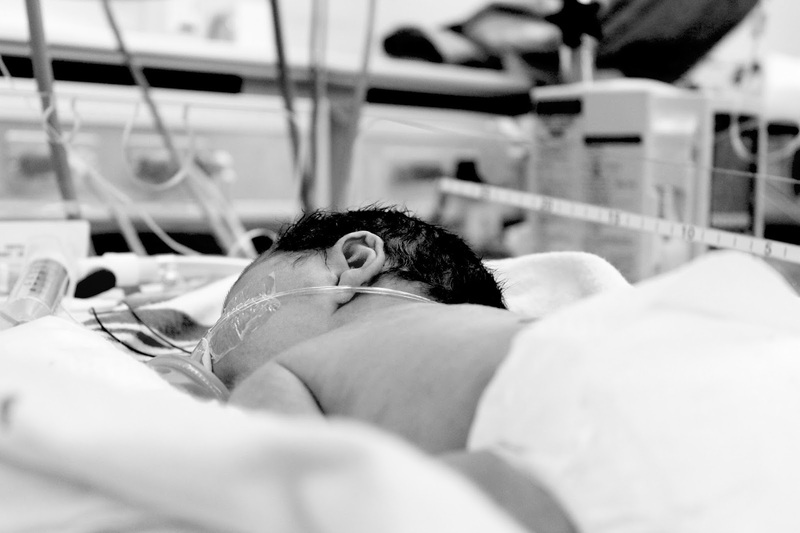 By the time I was started on IV fluids, I started crying because I realized the possibility of having a 34 week preemie was becoming very real, and honestly, that terrified me. The doctor on duty that day said he would try his best to stop labor, then we would see where I had progressed the next morning. My contractions slowed down by the time I had been given medication. By the next day, I hadn't progressed at all, so they sent me home with meds, and instructions for strict bed rest. Strict bed rest with a toddler is pretty much non existint so Josh decided to take the week off. Between him, and our parents helping, I stayed put on the couch until the following weekend. But, not without a second hospital stay (regular contractions again), and two other triage visits. My emotions were all over the place, because my body was wearing down, and I knew they wouldn't be able to keep labor off much longer. On January 3rd, I woke up feeling better than I had all week, and eerily my contractions were non-existent. Call it intuition, but I knew that "burst of energy" feeling, and that it wouldn't be much longer. I pacified myself with re-packing my hospital bag, sending Josh to store for a few pantry items for the house, and trying to rest on the couch. 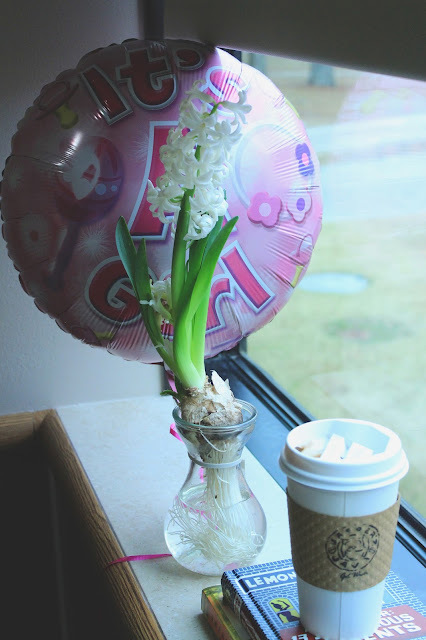 By mid-morning the contractions returned steady, and that "feeling" you get when labor is immenent really hit me hard. The contractions continued to strengthen, so I timed them each hour. I tried resting on my side, laying down, and walking through them to determine if it was the real thing. They continued throughout the day slowly getting closer. Knowing we would be heading to the hospital at some point that night, we headed to Josh's parents house. I wanted Evie snug at her grandparents house that night, rather than being woke up and whisked away in the middle of the night. I'm so thankful that worked out, and was one thing I had prayed for. This time, triage was routine, and most of the nurses had met me at that point (five visits in one week? I dubbed myself frequent flyer). I cried because my doctor wasn't on duty. I cried because even though we had made it to 36 weeks, there was still a chance she would be pre-mature. I also cried with relief, because I knew my body was done, and there wasn't anything stopping it. Thankfully, my contractions slowed again, so I made it through the night with very little progress. I say thankfully, because it bought baby girl more time (every hour counts! ), but also, my doctor was on duty that day!! I haven't felt that excited or relieved in a LONG time. She knew how horrific my previous delivery had been, and how desperate I was to have her deliver for me. And it was literally a walk in the park in comparison. The hard part came seconds after she was delivered. There were breathing problems, and other issues. Even though Evie had been delievered at 36 weeks, the doctors think she was closer to 37 and didn't declare her a preemie. So, this was a new world to us. I was pretty dazed that day, and finally got to visit her in the NICU that evening. I'm not sure what I was thinking, but I had failed to think through the process that she would be hooked up to so many wires. It broke my heart. It also hurt not to hold her until she was 24 hours old. Every day was a waiting game. Slowly, but surely her condition improved, but my adrenaline eventually crashed on the third day. My toddler was an hour away with her other grandparents, and we had been seperated for five days at that point. My husband needed to return to work (he had already been off 1 1/2 weeks due to my bed rest). I was trying to recover in a boarders room at the hosptial, but let me just say staring at hospital walls, being in pain, and having very little order to my life about set me off the edge. I just reminded myself that the girls needed me to be strong. Every day I would visit, sometimes getting to hold her, sometimes just staring and crying. There isn't much privacy, so I got used to crying in front of strangers. On Friday, I lhit my breaking point. I don't think I have ever felt so low. They had tried to slowly ween her off ox that day, only for her to start breathing too fast again. She was also jaundiced and had to be put under the lights, so we couldn't hold her until the next day. It just felt a bit too much, so Josh whisked me away to visit Evie at her grandparents house. I felt like the worst parent in the world leaving the hospital, but I desperately needed time with Evie. Her snuggles made me feel much more relaxed, and less anxious about the seperation. She still loves me. ;-) We realized we needed to make plans, as the doctors gently reminded us it could be a few more days, or even weeks of her remaining at the hospital. Somehow, we made peace with that, made our plans, and headed back to the hospital. It was very late that night, and the nurse on duty cheerfully announced she was doing great! Apparently, after we left, they removed the oxygyn, and she was doing GREAT. She passed the five hour mark, and if everything went smoothly through the night, they would move her to our room the next day. The next morning, we woke up to our little sugar bear getting to spend the day with us in our room! Holding her without wires was amazing. We snuggled the rest of the day, and slowly but surely, it felt like maybe life would be returning to normal. Our nurse stopped by and said the pediatrician planned to discharge us the following morning after being seen. Two weeks of living in limbo, and feeling very disoriented about everything, we are all home as a family of four. Our Ella Bug is doing great, and she received another thumbs up at our follow up appointment. I am thankful that He proved His faithfulness again. 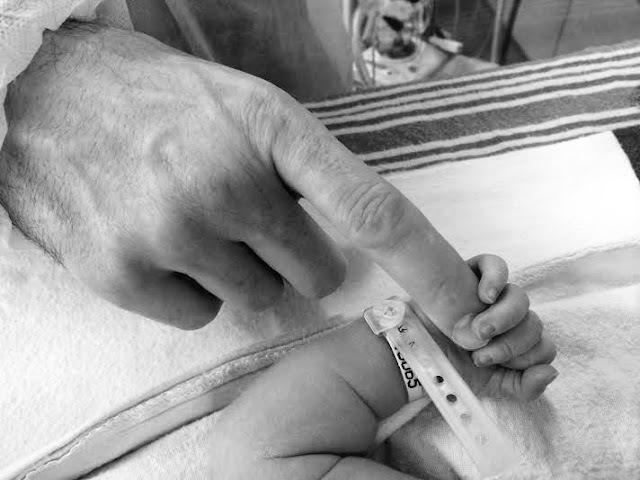 Also, NICU parents are my heroes. I won't stop thinking about them or the families that were still there, and had a long way to go. It's humbling, and heart wrenching. It has also reminded me to count my blessings. I am so thankful for our Elleanor Faith. She's already taught us so much. Congratulations on your sweet new baby girl!!! I'm sorry it was so stressful and not what you had hoped. Congrats! So glad you're all home now and she's doing great! Enjoy that little sugar bear and her big sister! God is good. Many many congrats to you and your family! I just emailed you back not realizing your bundle was here! What a story! Glad to hear you are all home together now! :) And her name! Beautiful!